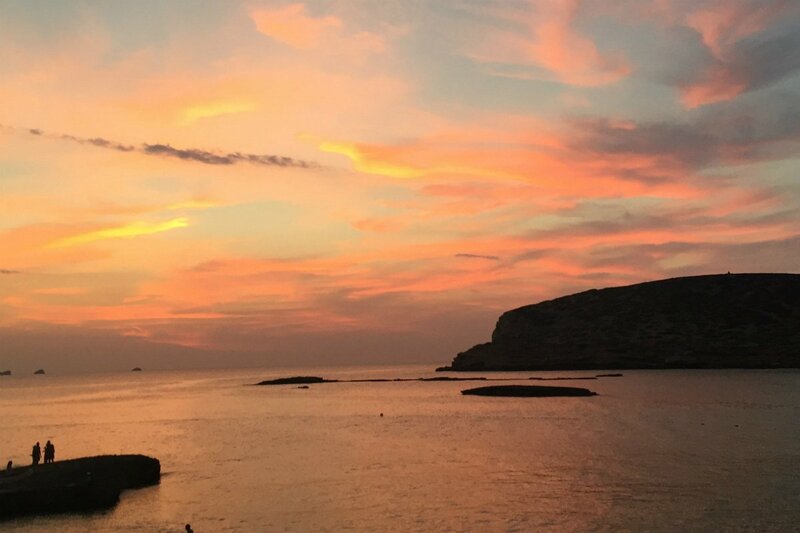 Cala Conta sunset. Photo by Delfina Forstmann. It may look like the island life has been lost to scene-y restaurants and nightclubs, but hippie markets and low-key hangouts still thrive in Ibiza. Here's what to do if you're going for the chill. IBIZA, Spain — The Balearic Islands are a cluster of Spanish territories in the Mediterranean, off the coast of Valencia. 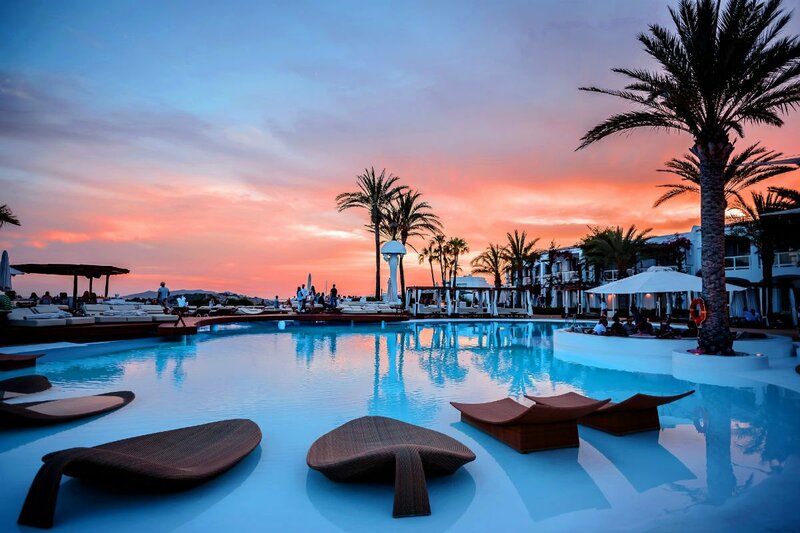 The most famous of thee islands is Ibiza, and it’s arguably the most multifaceted. 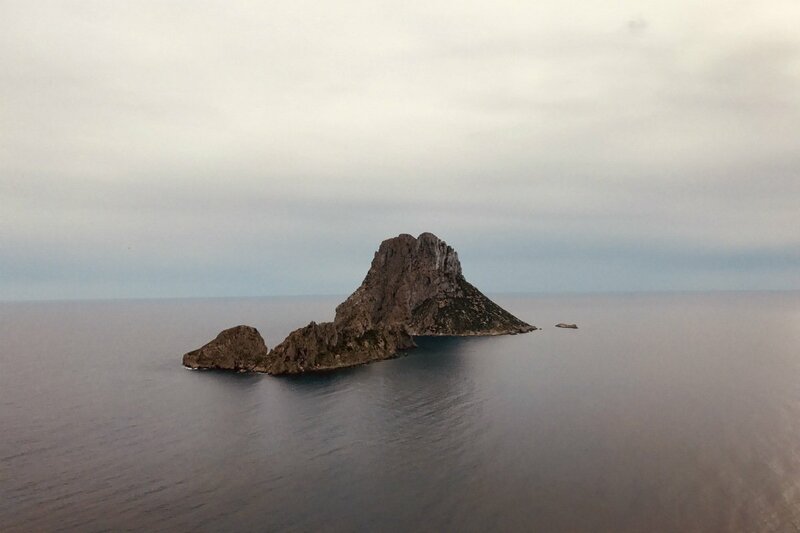 Once inhabited by hippies, it was first known as a spiritual place with sacred areas and the mystical Island of Es Vedra just on its horizon. I’ve been traveling to Ibiza every summer for the last 17 years, and in that time, I've seen it evolve in to a entirely different beast. Jump forward to present day, it’s become the Vegas of Europe, complete with the what- happens-in-Ibiza-stays-in-Ibiza attitude. Tourists from all over the world come to experience the wild raves, the now-expensive restaurants, and the trendy beaches. Let’s be honest: Many flock with the intention of trying every drug under the sun. Somehow, some way, parts of the island have maintained a chill, whimsical vibe. That’s the Ibiza I love. To sum up a day: Wake up at noon, have lunch at 3 p.m., take a siesta on the beach, have dinner at 10 p.m., rave after that, and repeat. Everything is slower, more relaxed, and simultaneously more wild than any island in the Med. After years of going to Ibiza, I still feel like I've only scratched the surface. You can really customize your trip depending on what kind of traveler you are. There is a party going at almost every hour of the day. Beach parties turn to dinners accompanied by DJ sets; clubs host after-parties and after-after parties and the cycle continues. It's easy to break it up (or just make a break for it) in small towns, acres of untouched nature, secret secluded beaches, and isolated villas. The blue waters of Ibiza. Photo by Delfina Forstmann. The stunning coast. Photo by Delfina Forstmann. Ibiza is quite big and most things on the island have developed in clusters. Hills and cliffs makes beach drives longer than they might appear on a map. The nightclubs, too, are a decent drive from town and relatively secluded (except Pacha). Go to Fomentera, the smallest of Spain’s Balearic islands and a 30-minute boat ride away from Ibiza. You do not want to miss the clearest blue water in the Mediterranean. There are an array of resort-style hotels like Ushuaia and Hard Rock, but in my experience, these make for the least pleasant accommodations. The island calls for something more boutique and intimate. Even if you plan to go out a lot, it's nice to have a peaceful place to come home to. Definitely on the pricey end, but it's a special find. Built on the grounds of the city’s Roman acropolis within a UNESCO World Heritage Site, there are only eight rooms. 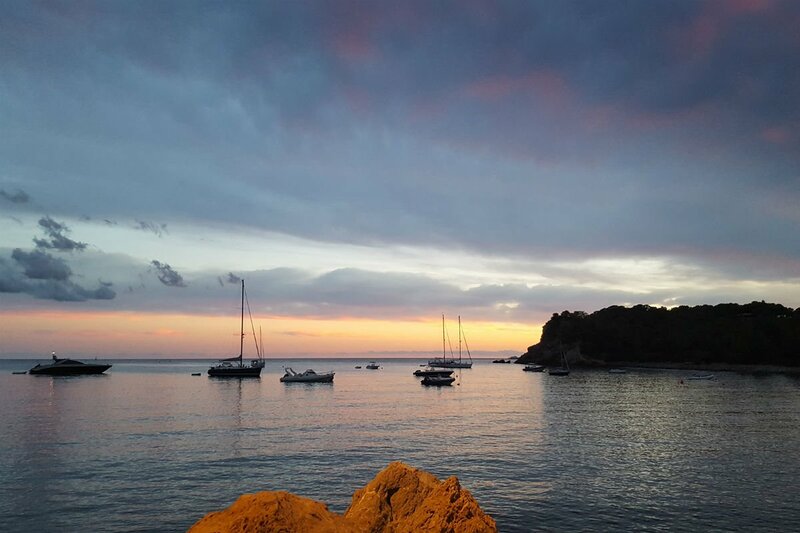 You’re a walk away from Ibiza town but nestled into the quieter and more cultural side of Ibiza. The views are beautiful and the rooms are quaint and clean. You’ll really feel the energy of a small European town. Staying in a villa is an amazing way to experience the more rustic side of Ibiza. Some are inland, where the air and earth are dry and the smell of rosemary is intoxicating. Other villas are perched on theedge of cliffs overlooking the sea on the cost of the island. A massive white building smack in the middle of the action. Its a 15-minute from Ibiza town and a ten-minute walk (in the opposite direction) from Marina Botafoch. It is basically across the street from the famous Pacha and right around the corner from Cipriani and Heart. If you’re looking for a social and buzzy experience in Ibiza, this could be a good fit. The hotel is clean and modern with a large pool, spa, and restaurant. The pool at La Torre del Canonigo. Photo courtesy of La Torre del Canonigo. The pool at Destino. Photo courtesy of Destino. Modern and boutique with 152 rooms. There's a hip Mexican restaurant downstairs, , which attracts a lot of attention. The hotel is a short drive to Ibiza town and right on Talamanca Bay (though, I don't think the beach does Ibiza's beautiful seaside justice). There are frequent DJ sets around the main pool during the day, although most end before 1 a.m. You can get tickets or tables to these even if you're not a guest of the hotel. This is a good option if you’re having trouble finding a serviced villa, as there are houses on the property with full pools and views of the sea. You won’t have the same privacy, but the vibe is similar. The pool is open to the public and is a nice place to have lunch or drinks if you're taking a beach break. Try not to get too drawn into the lights and the music. Take some time to get into nature. The beaches, hilly landscape, and cliffs are beautiful and fun to explore on foot and by car. 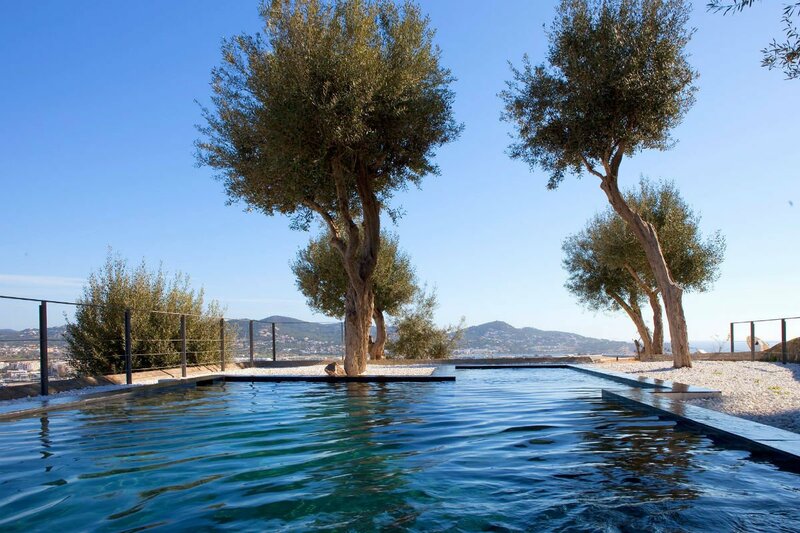 The creator of Cirque de Soleil, Guy Laliberté, has an incredible property with installations in , on Ibiza's southwestern coast. It's not the easiest to get to but its worth seeing. Liberté also host's psychedelic afterparties in his private villa. If you can make it on the guest list, they're not ones to miss. The views from the cliffs are stunning and the beach is clean, beautiful, and laidback. 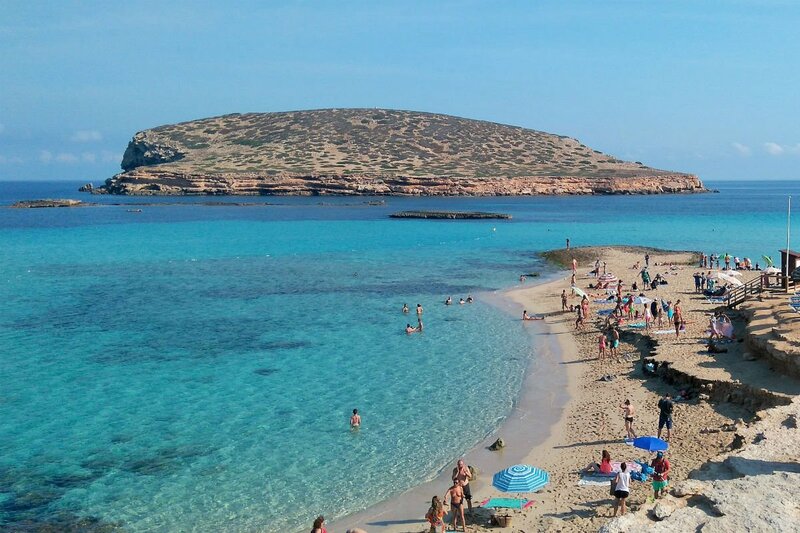 , on Cala Conta, has become a hotspot for tourists and locals alike. 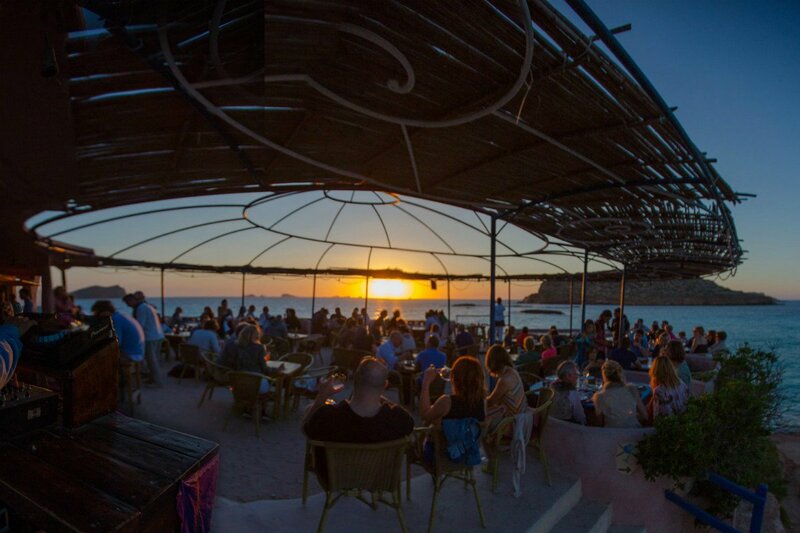 Starting as a no frills chiringuito (A small bar with drinks and tapas), has now evolved into THE place to watch the sunset in Ibiza. There's a boutique full of unique, Indian-inspired and hippie-style clothing and accessories. The owner himself is a local legend. And his motto encompasses Ibiza perfectly: Relax to the max. 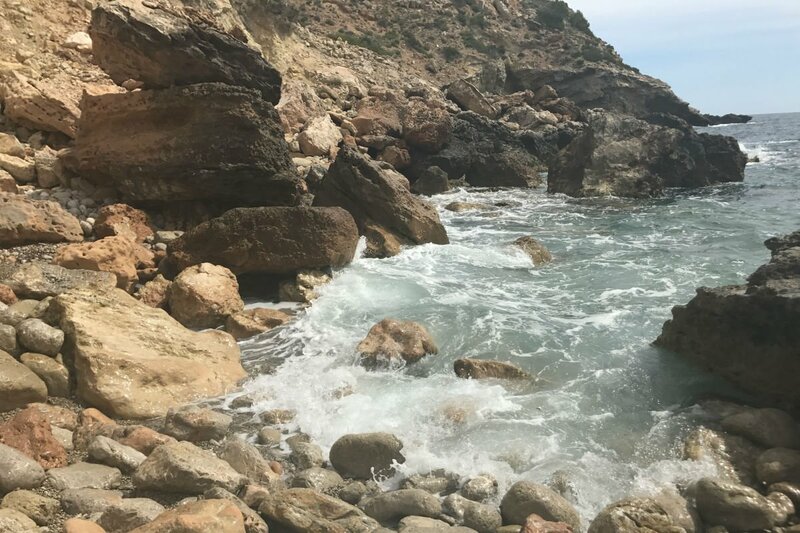 I recommend packing lunch and towels and heading to this beach on the western shore of Ibiza. It's 13-miles away from Ibiza town. Es Vedra, Ibiza. Photo by Delfina Forstmann. Sunset Ashram at sundown. Photo courtesy of Sunset Ashram. Charming and full of local artisan-owned boutiques. The Roman ruins of the old town are UNESCO-stamped. It's a really sweet place to walk around in the late afternoon and early evening. At night it becomes a bit dodgy — I wouldn't recommend going after midnight. The marina is relatively new and chic. If you're interested in a little shopping or a drink overlooking Ibiza town, take a stroll around. One of my favorite places for a rave. A rotation of incredible DJs and parties (with Circo Loco being one of the most famous). It starts early and goes until early ... the next morning. It may seem obvious and overrated, but it's fun to stop by once for the sake of it. If you haven't been before, the Flower Power party is the most tame: hippie-themed with '70s hits on repeat. The Hippy Markets capture the essence of Ibicenco roots. They are definitely worth checking out if your trip overlaps with the market schedules. Two of my favorites are and . The market at is also amazing, with afterparties held there regularly. You cannot actually go onto the island (unless you take a boat), but you can get pretty close on land from the cliffs of Cala d'Hort — watching the sun disappear behind Es Vedra is breathtaking. Seeing the island almost feels like a holy experience. There are stories about mysterious herds of goats that inhabit the small, abandoned island in the middle of the sea. The rock is said to hold positive energies — oddly, you’ll often see a ring of clouds circling the top of it on a completely clear day. There is a ferry that leaves from the Port of Ibiza or there are boat rental shops in the marina and in Ibiza town if you want to stay on sea. It's possible to find a decent-sized day boat at a reasonable price. 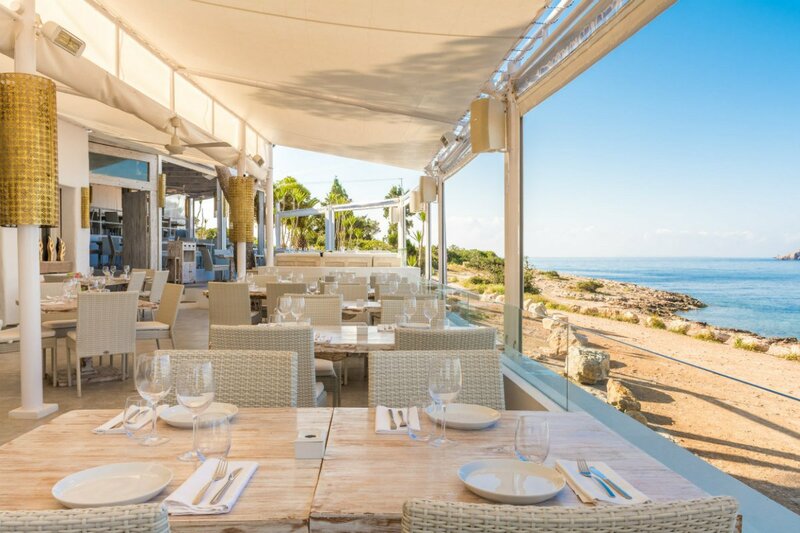 The restaurants on Formentera are rustic and most of them are right on the beaches, surrounded by water that is a clear as the Caribbean. Circo Loco at DC10. Photo courtesy of DC10. Sa Punta during the day. Photo courtesy of Sa Punta. A family-run gem doesn’t get the attention it deserves — which is one of the best parts about it. Tucked off the side of PM-804 in Santa Gertrudis, you wouldn’t even know it’s there unless someone informed you (you’re welcome). The food is incredibly simple and classic. The freshest tomato salad you’ll ever have (chopped up with olive oil and onions), and perfectly cooked meat. Dine al fresco in the candlelit courtyard. Far away from the wild bustle of Ibiza town, tucked in to the quiet town of Santa Gertrudis. Under fairy lights and clusters of tall trees are simple tables, casual vibes, and some of the best Italian food on the island. The Milanese is my personal favorite, and the pizzas are made to perfection. If you're feeling festive (and ready to spend some money) this is the place. Owned by Guy Laliberté, there's a Cirque de Soleil-inspired show every evening along with dinner. The food is artful and all of the dishes are in circus theme. The restaurant transforms into a nightclub after dinner and there's a different DJ every night of the week. The upstairs food stalls turn into smoking areas and additional bar space. A chill vibe on Talamanca. The restaurant is three levels, each serving different cuisine: Sa Punta is Mediterranean, Patchwork is Lebanese, and Ginger is Asian fusion. There's also a homeware and furniture store with really unique pieces. The food (on all levels) is good — my favorite is Sa Punta. 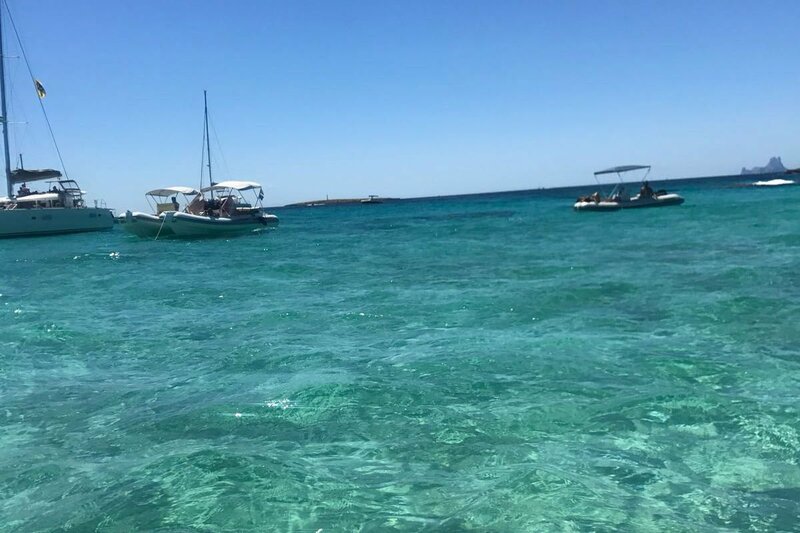 The crystal clear waters of Formentera. Photo by Jessica Nicholls. Es Xarcu at lunch time. Photo courtesy of Es Xarcu. 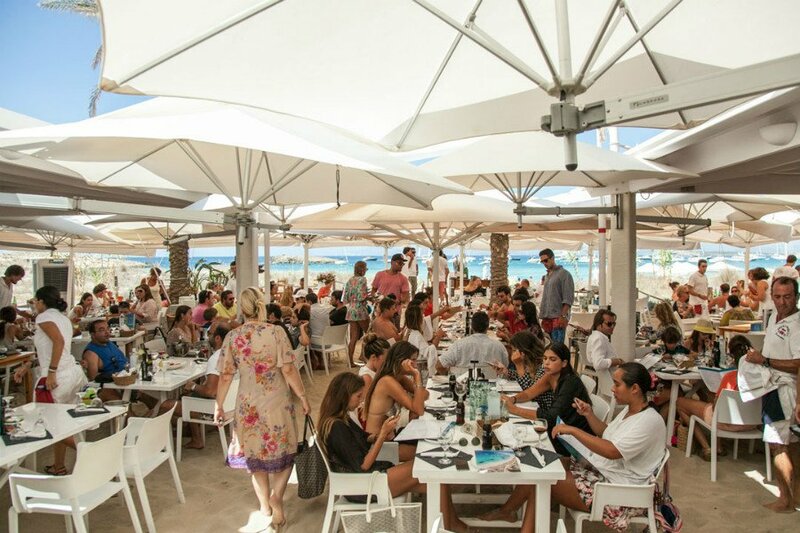 Beach restaurants in Ibiza are endless. Whether you’re looking for a day party, lounge-y music and drinks, or a rustic hippie chill-out session, there’s a bit of everything for everyone. For a laid-back but upbeat beach, this is the place to go. The food is really delicious — a mixture of Mediterranean seafood dishes, burgers, and ceviche. Its hip without trying too hard. The beach mattresses are comfortable, cushiony, and serviced (hello, endless pitchers of sangria). The sand is clean and the water is beautiful. A former mill belonging to the old salt industry of Formentera. 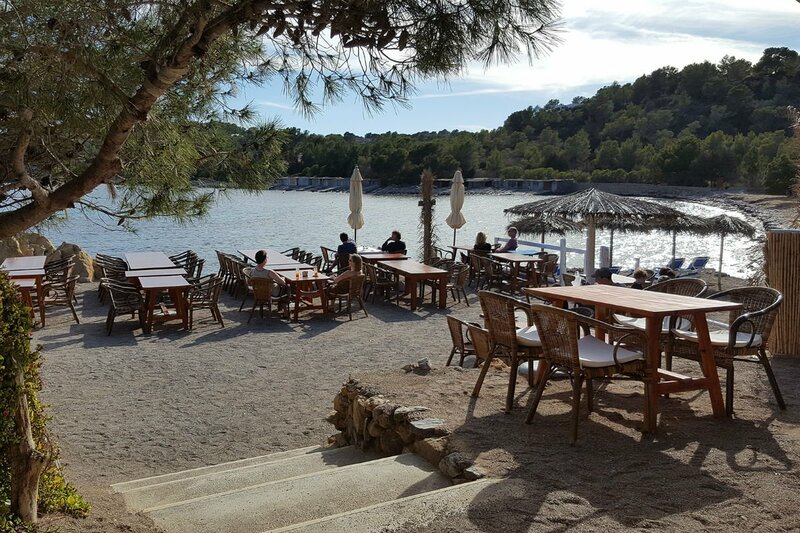 It has since been renovated and is now a shabby chic seaside restaurant serving up local, Mediterranean dishes. Some of the best local fish on the island. The food is seriously great, the vibe is very familial and relaxed. The beach is all rocks and the water surrounding it is clear. It's a great place to spend the whole day and watch the sunset. Lounge-y and relaxed. Despite the name, there actually isn't really a beach you can walk. It is on the water, though, and there is a tasty restaurant and comfortable sun beds. The paella here is really one of the best you'll find in Ibiza. The beach itself is rocky, making it difficult to get into the sea, so it's best to visit by boat or on an overcast day. Some will definitely argue that this spot in Formentera is overrated. Maybe there are better fish restaurants on the island, but Juan y Andrea is a must if you've never been. It's a place to see-and-be-seen but still feels down-home and casual. The food is fresh and although there are nicer beaches in Ibiza, I have a soft spot for this smaller and less well-known spot. The recently renovated restaurant makes for a very chill spot for low-key days where you don't feel like bumping into many people. The simple beauty at Es Xarcu. Photo courtesy of Es Xarcu. Ibiza Airport is about a 15 minute drive away from the port and the town. I would recommend renting a car as taxis are few and far apart and you’ll spend more time waiting around for one then actually driving. There isn’t much to say for public transport either. June and early July are my favorite times to go. September is also a great — its a little quiet but not dead and still very warm. August is the busiest month in Ibiza, full of tourists, hot, and impossible for making reservations. Bathing suits, pareos, alpargatas, beach cover-ups, sandals. If you're planning on going out, bring comfortable shoes and clothes. It gets hot and crowded and comfort is really key. Besides HEART, you won't need to dress up for any of the places I've mentioned. But you are on an island where anything goes — express yourself and know that no one will judge. Delfina is an intern at Popupla. She lives in New York City and travels for the work and play.